Evanston, Wyoming is known as the Queen City of the Mountains — dubbed so because Evanston's setting, with the meandering Bear River, lush pine and cottonwood trees and the nearby purple mountains, give her a majestic presence. Evanston was founded on the building of the Union Pacific railroad in 1869. The first train arrived on December 16, 1868. By July 4, 1871, the Union Pacific had located its roundhouse and machine shops in Evanston which assured the town a permanency that had been denied other railroad towns. 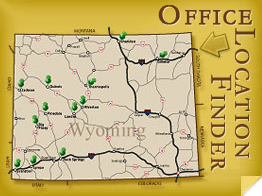 Wyoming Downs Racetrack is located 8 miles north of Evanston on Highway 89 for thoroughbred and quarterhorse racing, and parimutuel betting. B.E.A.R. Parkway runs along the section of the Bear River that flows through Evanston. Bear River State Park is Wyoming's newest State Park.